You should find a few local trainers and have them evaluate him. They can also give guidance as to how to start, which prey games to encourage, etc. A good foundation can make such a difference in an adult -- find someone soon so you can get comfortable too. Make sure you choose a club that is open to bull breeds. 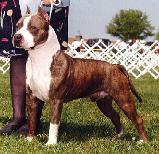 Many traditional clubs are prejudiced against anything that is not a guardian breed or herder. Also, schutzhund take more work than any other dogsport. To do well at it you are going to have to do lots of work on your own. Tracking in the morning(at least 2-3 times a week). Obedience work at home, at least a few times a week and then the grip work at the club, at least twice a week. Also, it takes a good dog. You need a dog that is extremely confident, has prey drive and focus. Also the imprinting you have done so far, can play a big part. Good luck in you endeavor, as it is very rewarding.